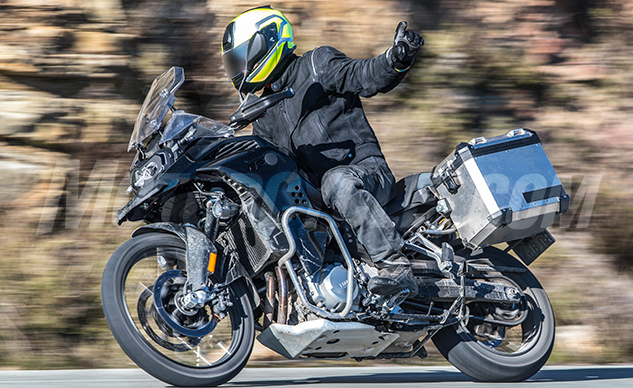 A couple months back, we published a spy photo of what looked to be a new BMW F850GS Adventure. We can now confirm the F850GS Adventure has been certified by the U.S. Environmental Protection Agency as a 2019 model. Based on the new F850GS (more on that below), the Adventure model is expected to have a larger fuel tank, a bigger windscreen, a thick bash plate and crash bars, and likely a stronger rear subframe to better support the weight of a passenger and luggage. The EPA certified the Adventure version alongside the regular F850GS and F750GS, indicating they share the same 853cc parallel-Twin engine. BMW claims the F850GS produces 100.6 hp at 8250 rpm (the F750GS is electronically restricted to 76.4 hp) but the EPA’s certification document rates the engine at 88.5 hp at 8000 rpm. We’ll likely see the 2019 BMW F850GS Adventure at one of this fall’s big motorcycle shows, either Intermot in Cologne, Germany, in October or the EICMA show in Milan, Italy, in November. As for when we’ll see it in showrooms, that’s a good question. The F750GS and F850GS debuted at EICMA last November and are available now in European dealerships. Neither bike is currently available in the U.S., however, nor do they appear on BMW’s U.S. website as of this writing. It’s possible BMW opted to delay introducing the new bikes so dealerships can clear out their inventory of F700GS and F800GS models. From the EPA’s document, it now appears the new models will be part of BMW’s 2019 model year lineup alongside the new Adventure version.